To view a live Demo of EDI2XML, our EDI to XML converter, please fill out the form below. Included in this Live Demo is a Free 1-hour EDI Consultation with one of our EDI experts. 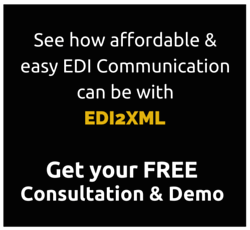 Sign up today to see exactly how EDI2XML’s Translation Service & Solution can solve your business requirements & challenges.